Is there someone you care about who you’d love to look and feel great in our designer activewear? Not sure which of our many fabulous designs they’d most appreciate? Let them choose… and you’ll both be assured full satisfaction, knowing they’ve got the perfect gift from Courage My Love Clothing. ** Subject to our Gift Card Terms & Conditions. Have you ever had that unpleasant feeling of having to give a present to someone, but not knowing what to buy? A gift card makes life easier for both the person who buys the gift and the person who receives it. Maybe you have thought about buying a present for someone on Courage My Love but couldn’t decide what to choose. You might have worried about getting the size right or choosing something they like. Or even worse, what if the package doesn’t arrive in time for the occasion? Now you can make hassle free, reliable gift card purchases with Courage My Love and it will be emailed to your recipient on the date that you choose. No fuss, no worries – only pure joy to the lucky person who gets that gift card in their inbox! Our gift cards come in different set dollar value amounts of $50, $100, $150, or $200. Alternatively, you can set your own value by buying a flexible value gift card. You can choose the date for your gift card to be emailed to the recipient. No more embarrassing moments to live through by missing the date! Now you can plan way in advance to have your special person feel treated on that very special day. Whether it’s Merry Christmas, Happy Birthday or Congratulations; our gift cards allow you to make your very own messaging to suit the occasion. 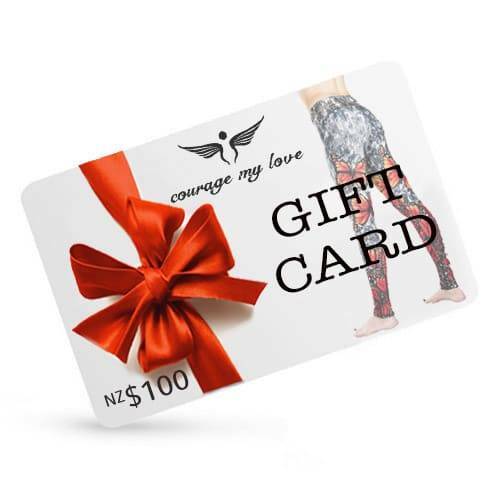 What’s not to love about Courage My Love gift cards? In fact, if you have a special occasion coming up, you might want to suggest the idea to your friends and family, so you won’t get any gift disappointments!